Can Lomachenko punch savagely as a bullet? VASYL Lomachenko solemnly followed his father’s emergency order: Go to the body. It’s however not surprising that there would be confusion among ringsiders on the manner Jorge Linares succumbed to sudden detonation in the tenth round of the WBA lightweight championship at the Madison Square Garden on Sunday. There were those who said Linares took a knee, before being counted out by the referee. One expert claimed it was a punch to the mid-section, while another authority said it was a left to the chest that crushed and sent Linares crumbling, like a shooting victim. The television eye recorded it honestly. It was a left shot to the liver (section) that stopped Linares, who was clashing fiercely with the younger, sharper Lomachenko, popularly considered the finest boxer in the world today. It was quite clear Linares suffered a soundless devastation, caused by five punch combination, capped by a bullet-like left straight to the liver. Of course, the most deluded witnesses belonged to Team Linares, who would cry the referee had halted the fight prematurely. 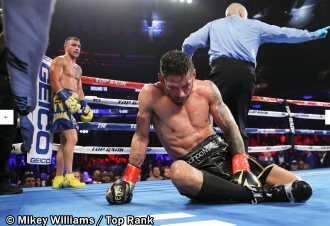 Linares did try to get up once the referee had reached the nine count –“NUEVE”—but that was the best that could be said of his effort. Lomachenkko, ever elusive, was decked by a book-form right to the head in the sixth after he stayed long in the middle. He would make no excuses, and readily owned up to the miscue. He also cracked that it would be easier to find worthier opponents from thereon. Promoter Bob Arum said Lomachenko, whom he loves to call the Picasso of Boxing, would be lined up for a fight, possibly against Ray Beltran, the WBO lightweight champion,on August 25. There was also mention of the unbeaten Mikey Garcia, the WBC lightweight ti6tle-holder. Meanwhile, World Boxing News reported on Sunday that Manny Pacquiao was also interested in fighting locchenko. “Lomachenko just beat Linares and he has the lightweight belt, which means we can fight for a title,” Pacquiao said.